I am beyond excited about going into my senior year of high school. As you may know, I will have many responsibilities, activities and events coming up. I am proud to announce that I have been granted automatic admission into the University of North Texas (UNT) in Denton, Texas. I have also been accepted into a program at school that allows me to intern for sports marketing-related companies. Although my parents provide support for many of my extracurricular activities, I want to help fill in gaps. I will be focusing on my golf game this summer to increase my competitive presence. I’m playing for the Arlington Martin High School girls golf team next year and I am in need of sponsors to help support my extracurricular activities. My first year, I placed second and sixth at two regular-season tournaments and 16th at the JV districts. When the season finsihed, I received the MHS JV Outstanding Golfer award. She could be hitting off the driving range or putting on the practice green. It doesn’t matter to Denise Miller. The high school senior who only took up the game of golf two years ago, can already see beyond the fairway. Miller envisions the lessons she learns at First Tee in For Worth will not only improve her golf swing, but also prepare her with the life skills she needs to move forward. 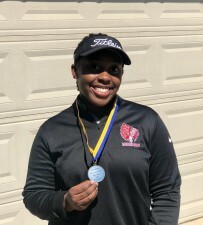 First Tee is a youth development organization that impacts young people like Denise by providing them with educational programs that build character, instill life-enriching values and promote healthy choices through the game of golf. But, like many good things in life, those learning experiences come with a cost. That’s why the 16-year-old at Martin High School in Arlington, Texas, launched a crowdfunding campaign on YouHelp.com. She is appealing for donations between $5-$10 per month to offset the cost of her instruction with a Professional Golf Association coach. Miller, who was accepted into the internship program at First Tee, is off to a good start. Since launching the campaign at the beginning of the month, she has reached half of her $550 fundraising goal. Miller credits much of her crowdfunding success to social media, where she was able to spread the news about her campaign beyond family and friends. YouHelp provides Miller and campaign organizers like her with a free platform to make those connections. Success stories beyond the golf course are a legacy of the First Tee program, which began as a partnership with the Ladies Professional Golf Association, Masters Tournament, PGA of America, PGA Tour and United States Golf Association. Since its inception in 1997, First Tee has reached more than 9 million young golfers throughout the United States on courses, in schools and at other youth-serving locations. Miller said even though most of her friends are not golfers, she was not intimidated to take up the game by herself. Last year, her first as a member of the Martin High School golf team, Miller found very little to fault. She was named outstanding junior varsity golfer, an honored that surprised her. Not about to rest on her laurels, she is very much aware of the mental aspects of the game. Half my goal was reached yesterday! Thank you to Ms.Sherrie and Ms.Rita for helping me get there. My first two donors have helped me reach 20% of my goal. Thank you so much!